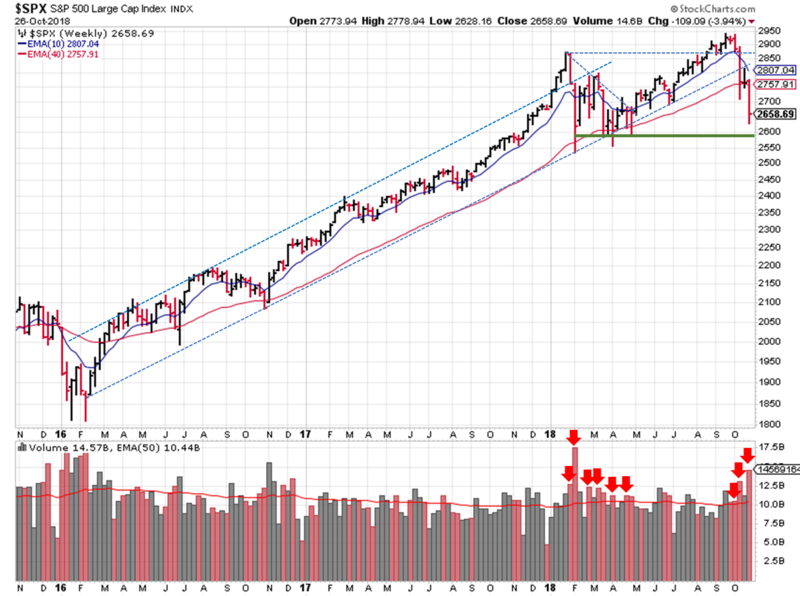 The 200 day moving average was the latest support level to fall in what is a REALLY red October. The only good news seems to be that everyone thinks the markets are way oversold and should bounce from the current levels. But isn’t the consensus usually wrong? Remember to follow your buy and sell rules, not the talking heads. When the selling is over, there will be great buying opportunities. 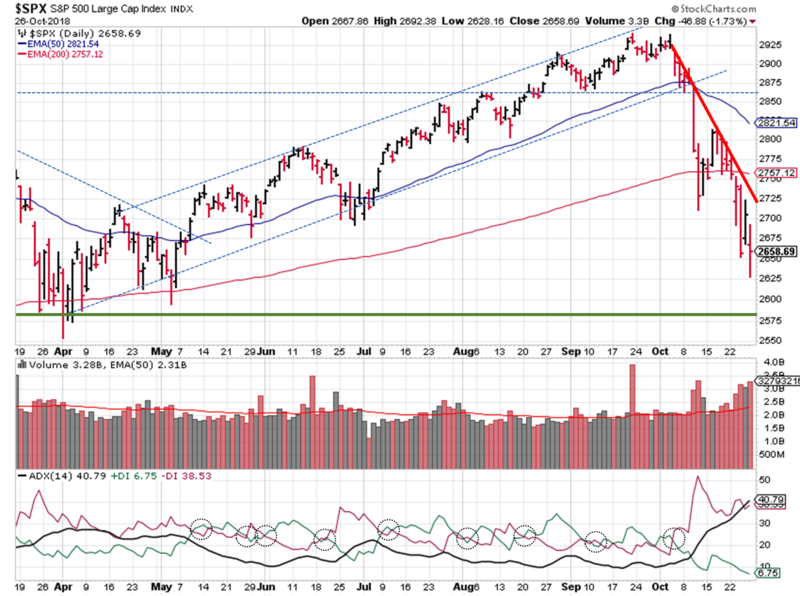 All the indexes continue to trade below their 20 and 50 day moving averages, keeping this signal in a downtrend. Since prices continue to fall on higher than average volume, the price/volume signal remains in a downtrend too. OEW also continues with a downtrend signal. They’re also stating that we’re very oversold, and expect a brief rally in the near term. The S&P ($SPX) fell well below the 200 day moving average last week. 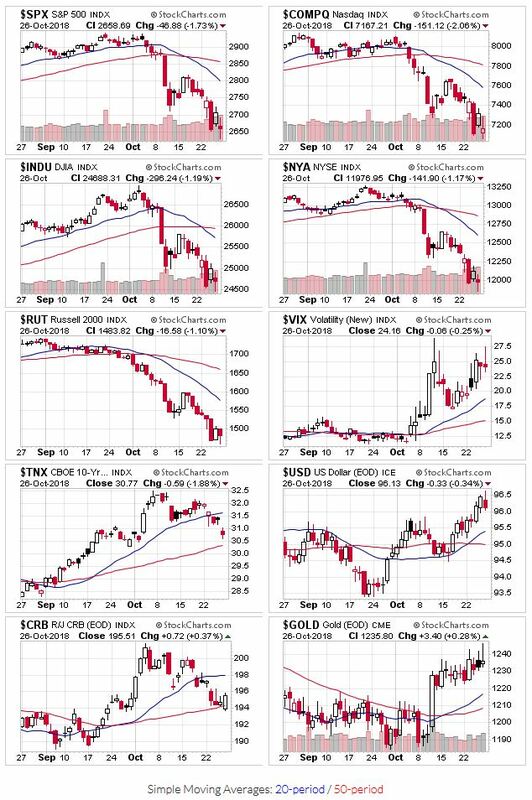 The character of the US markets has shifted during October and from the chart you can clearly see the old adage in action; prices take the stairs on their way up and the elevator on their way down. More than likely we’ll see a test of the April low price level within the next two weeks or so. Expanding the view, you can see that January 2016 was last time the SPX closed substantially below the 200 day / 40 week moving average. At some point, the lower stock prices will bring in big institutions…so watch for trading volume cues. I took my own advice and checked my watch list. It wasn’t pretty. But there are a few names that have held up well, relative to the overall market. And those names are the ones I’m watching closely for signs that the selling is complete.